I feel like such a cheapskate at times. Cheapskate in the sense that I love a good bargain and I do everything I can to save a buck or two. I have a confession to make. I'm not using cloth diapers on Anna to help keep disposables out of landfills and save the environment. It's great and all but the real reason is so I don't have to spend $20 buying diapers each week. 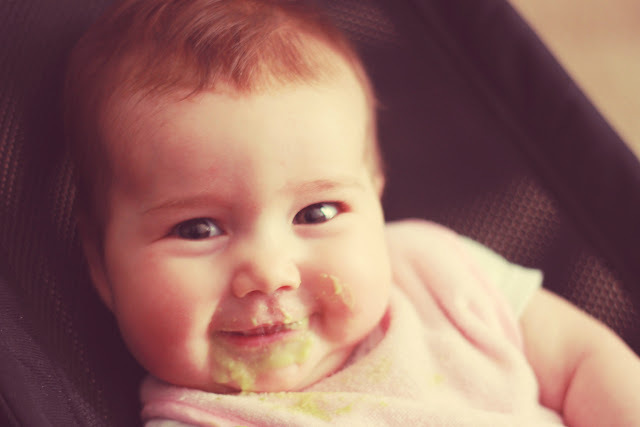 I'm also not making Anna's baby food just because it's healthier...gasp! I feel horrible just typing these words. It's amazing that I haven't had to buy one jar of baby food yet because I've given her food we already eat (bananas, avocados, and brown rice). And it's so easy!--well so far. Maybe I'll cave after she begins eating a wider variety of foods but for now I'm thankful I can throw what we already have into our little Ninja food processor, save a few bucks, and know it's the best we can give her. That's the thing I love about introducing foods to Anna, the best foods we can give her are the cheapest! Why wouldn't I do this for her? Why wouldn't I give her the best? Why wouldn't I save money? Some may say it takes longer than just popping open a jar. And they'd be correct. But like I said in my second sentence above, I'll do everything I can to save a buck or two and that means I'll take a little time to prepare Anna's food knowing it saves money plus it's better for her. All I see in front of me is a win-win! Since Anna's only 6 months old we're just now introducing solids to her. She's had bananas (come to find out she doesn't like them at all! No more Anna Banana **sad face**), avocados (which she loves! ), and brown rice (we're still on the fence). This week I'll be introducing pears which I'm hoping she'll just gobble down. I've been reading Super Baby Food by Ruth Yaron who shares everything you need to know about feeding your baby including age appropriate foods, offering a balanced diet, and recipes. It's been a great resource as we begin this new stage with Anna. After reading some of Yaron's tips and advice I'm realizing that not only does it save money preparing Anna's food it really is the best option for promoting a healthy life. And that makes this Mama happy! 1. Measure a cup of water on the stove to boil. 2. Measure 1/4 cup of brown rice into blender. Grind it very well, for about 2 minutes. 3. When the cup of water starts to boil on the stove, turn the heat down to the lowest setting. Sprinkle the ground rice into the water while stirring briskly with a wire whisk. Cover the pot and keep it over low heat for about 10 minutes. Stir frequently with the whisk to prevent scorching on the bottom and to remove lumps. 4. After letting the cereal cook over low for 10 minutes, it's ready. Wait, it was that easy?! YES!! I make Super Porridge the night before and store in the refrigerator in individual serving bowls (it lasts for 2-3 days). In the morning I pop a bowl in the microwave for 15 seconds, add Anna's vitamin D, and it's ready to eat! For a little flavoring I add avocado--and hopefully later this week pears. Take a sharp knife and cut avocado in half crosswise so that you have two "cups". Remove the huge seed. Use a spoon to scoop out flesh from peel and place on a flat dish. Use a fork to mash flesh on dish. Spoon into ice cube trays and pat flat with your clean fingers. Freeze for up to 3 months. Serving size: 1/2 to 1 food cube every day. When ready to serve pop a cube out and into the microwave for 20 seconds. Then I stir the avocado into the super porridge for a yummy breakfast for Anna! I'd love to hear what you've served your little one! What are your favorite recipes? You are so smart! I'll have to save this for the future. Love it! And Anna is adorable!! thanks for posting this!! my friend ashley james sent me the link because my kiddo is a little younger than yours and i'm trying to eat much more clean these days. i guess we all went to anderson? small world! anyway, thanks again! i'm going to check out that book!! Hey LaNesha, Yes, I remember you! Erin (Marler) Coker is one of my best friends and I know you two hung out sometimes :) I'm honored Ashley sent this post your way. I checked out your blog too and love it! I'll definitely be checking in often. Your little one is precious! 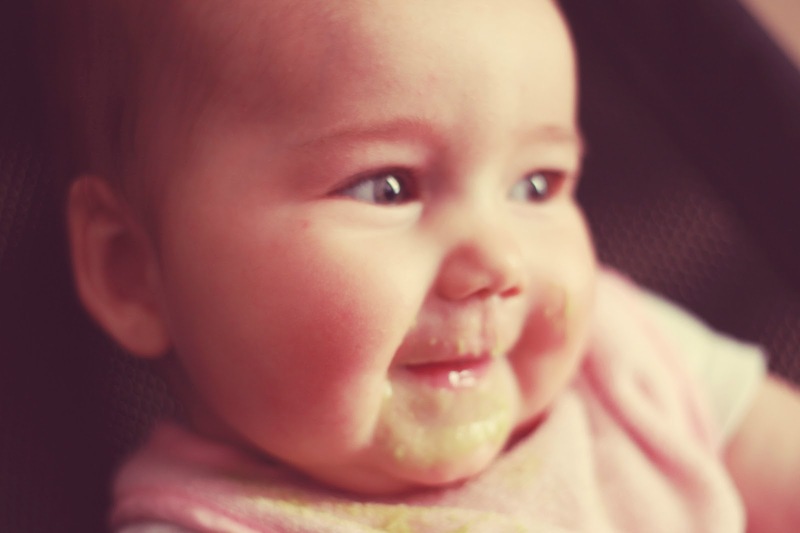 Good luck with beginning solids, it's been fun! This is what we did for both girls! So EASY! We did everything: peas, beans, sweet potatoes, carrots, pears, apples, peaches, mangos. I am sure there were more but I can't think of it right now. Ice cube trays are the best to freeze everything in because you get a basic serving and can use what you want. I use to cook once a month for about three to four hours and have everything for a month!